This book introduces the fundamentals of computer vision (CV), with a focus on extracting useful information from digital images and videos. 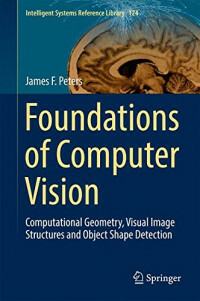 Including a wealth of methods used in detecting and classifying image objects and their shapes, it is the first book to apply a trio of tools (computational geometry, topology and algorithms) in solving CV problems, shape tracking in image object recognition and detecting the repetition of shapes in single images and video frames. Computational geometry provides a visualization of topological structures such as neighborhoods of points embedded in images, while image topology supplies us with structures useful in the analysis and classiï¬cation of image regions. Algorithms provide a practical, step-by-step means of viewing image structures. The implementations of CV methods in Matlab and Mathematica, classiï¬cation of chapter problems with the symbols (easily solved) and (challenging) and its extensive glossary of key words, examples and connections with the fabric of CV make the book an invaluable resource for advanced undergraduate and ï¬rst year graduate students in Engineering, Computer Science or Applied Mathematics. It offers insights into the design of CV experiments, inclusion of image processing methods in CV projects, as well as the reconstruction and interpretation of recorded natural scenes.